A drama series on FOX, 21 Jump Street debuted in April 1987 and ran until April 1991. The Stephen J. Cannell and Patrick Hasburgh series is noted for propelling Johnny Depp (as Officer Tom Hanson) to teen idol status and for being a hit for the then-newbie network. 21 Jump Street follows a team of fresh-faced young cops who go undercover in high schools and colleges to intercede with troubled youths. Show themes include AIDS, sexual promiscuity, hate crimes, alcohol, drugs, and child abuse. Series regulars include Depp, Holly Robinson, Peter DeLuise, Richard Grieco, Sal Jenco, Dustin Nguyen, Steven Williams and Michael Bendetti. The second season has now been released on DVD and features all 22 action-packed episodes on four discs. Guest stars include Christina Applegate, Jason Priestley, Pauly Shore, and Brad Pitt, in one of his first on-screen roles. 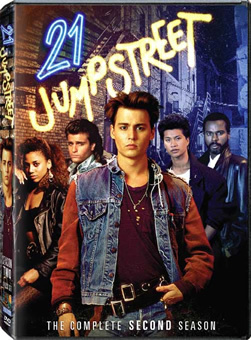 You can purchase 21 Jump Street: Season Two for $14.98 from Amazon. You can also try to win a copy here. Guidelines: This giveaway is open to participants with a United States mailing address only. (International readers can enter if they have a friend in the States who can accept their prizes by mail.) Many may enter but one person will win. You must be 18 and older to enter and no purchase is necessary. Contest ends June 9, 2010. UPDATE: Congratulations to “Christy” who won the DVD contest via an entry on our Facebook page. Thanks to everyone who entered. Stay tuned for more contests! It was and always will be one of my favorite shows. I love Johnny Depp. johnny depp is great . Love the show. Still a favorite after all these years. Johnny depp was very hot in this show and still is. I loved this show even when he left. 21…………….Jumpstreet! Holly Robinson singing the theme song. This still holds up as a great watch! This show was awesome when I was growing up! I just checked the Wal-Mart website and they still have it for $5.00. I am running out right now to get it. If they don’t have it locally, I’m buying it online. Still one of my favorite shows. I could watch them all day, if I had them!